Welcome to the Altenew Marker Release Blog Hop! If you're just stopping by you can start the hop at the beginning with the Altenew Card Blog. If you've been hopping along then you should have arrived from the Altenew Scrapbook Blog. Altenew is giving away a $50 gift certificate to SIX lucky winners! Please leave a comment on the Altenew Card Blog and Altenew Scrapbook Blog by Monday, November 27th for a chance to win. Six winners will be announced on theAltenew Card Blog and Altenew Scrapbook Blog on Saturday, November 29th. They are also generously allowing me to do a $30 gift card giveaway here! The winner will be posted on November 29th so make sure you first leave some love and then stop back to see if you're the lucky winner! Speaking of Winners . 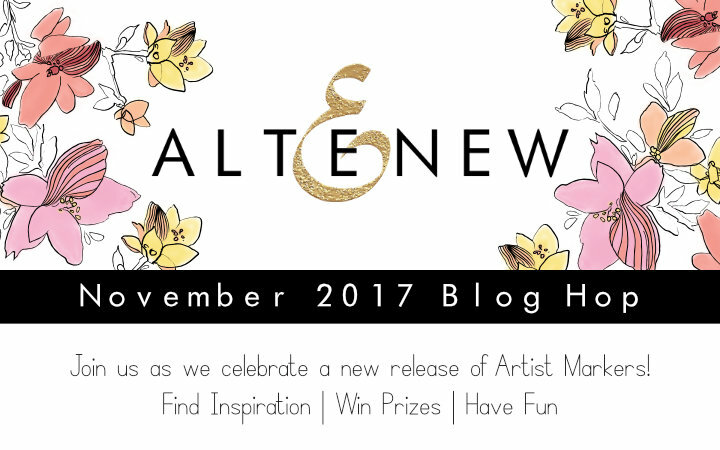 . .
To claim your $30 gift card please email winner@altenew.com by 11/30/2017 with the subject line Altenew 11/8/2017 Release Blog Hop Winner from Kelly Latevola's Blog. Alright, are you ready to talk Markers? Altenew already has one set of 12 "Set A" Today They are releasing two more sets. "Set B" and "Set C" are just filled with beautiful colors. They are also offering discounts if you buy them in a bundle. I actually used all three sets to create my card for today. I first stamped and masked my scene. When you're creating a one layer card you want to start with whatever will be in the foreground. For this card that was my flower and then the cup. I left all the masks in place and added an additional one to the bottom of the card for my table top. I put down some distress inks to create a background and then removed all my masks to get coloring! I did do a video but it's a long hop so feel free to skip it. The next stop on the hop is TaeEun Yoo! Thank you so much dropping by!! Here's the List of the Entire Hop in case you get lost along the way! Love the flower in the cup. Your coloring is so pretty. Love the beautiful, vivid colors. Gorgeous card. Wonderful, love the new markers and the vivid colors. Thanks for sharing. Hi Kelly, stunning card today, your coloring skills are amazing, I am hooked on your videos as well. 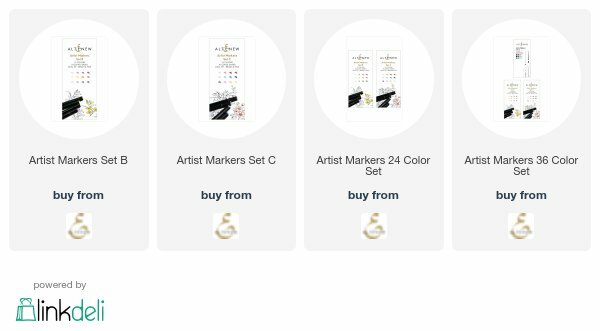 It is easy to see how these markers blend beautifully, they are now on the top of my wish list! What a stunning card! Loving the coloring job... TFS! Wow what a stunning card! These markers look so fun! Wow, what a gorgeous card. The coloring and blending is so amazing! Oh my!! Gorgeous coloring!! Stunning card!! I was so glad to see the Altenew new markers in action and, yes, the stamens turned out fabulous. Wonderful colors and I've been waiting a follow up set but there are TWO! I really need to get it! Your coloring and techniques is second to none, love!!! So pleased to see you work with the purple pens - I feel like I've been waiting forever for these to be released. Can't wait for them to get to the UK! Great shading on a lovely card! Wow... just W-O-W!!! I’m speechless, this is so superbly coloured! I like the beautiful vibrant colors. So pretty - those colors really jump right off the page. Your coloring is amazing. Thanks. Love your card and I really enjoy your videos! I have learned a lot about coloring from you! Thank you! These markers seem great, I like that they have a brush nib and bullet great for coloring. Thanks for sharing! I love to watch you color, and maybe you should go without sleep more often!! (It's ok. I did night shift for years and there are just days where you are hyper and a tad silly in a very fun way when you are sleep deprived! I actually enjoyed it!!!) There's nothing quite like a curious 4year-old...enjoy it while you can. My 4 year old grand boy is now a teenager--and even though the same thing happened with his dad, I am not sure how it happened so FAST! Thanks so much for all the instruction, help, fun, and encouragement that makes it you. You have made me obsessed with masking lol! I never had faith that I could pull off the amazing look you get from masking but... from watching your videos I finally gave it a try and now I cant get enough! Thank you for sharing your time and talent! You are Amazing (with alcohol coloring). Who doesn't love Altenew flower stamp sets. They are the Best!! Beautiful card, love your videos. Absolutely adore the tea cup. Nice touch. Wow what a pretty card. I loved watching the video of your process. This is a beautiful card - love your background. That makes your card pop. YOU are amazing! Thank you for sharing your talent and inspiring us! Love the card, Kelly and I so enjoyed your video. Thanks. You're right! You are amazing. What beautiful coloring on this gorgeous card! I love those colors together. Beautiful. wonderful card, Kelly - love to watch you color - and these new markers look fantastic - can't wait to get them! The flowers are so vibrant in your design. Looks like these markers will be fun to use. Very pretty. The joy of raising boys. I used to find action figures, fake eyeballs and plastic bugs, frozen in glasses in the freezer. lol I wish I had thought of freezer gnomes. You are amazing with those markers. Love to watch you work your magic! Can I just say....GORGEOUS!! Love this. Stunning card with amazing colouring as always. Love it. Very striking card, Kelly! Love it! I so thoroughly enjoy watching your videos and I swear that I learn something new every time I do. Fabulous work. I have to tell you that I love your nails! Blended so flawlessly. I did not know you could do that with markers. Gorgeous card. I enjoy your videos. Beautiful stunning card! I was really looking forward to seeing what you did with these markers since I am a total fan of your coloring! And I am completely amazed! Great design, love your colouring, thanks for sharing you creativety! As always your depth of color and combinations are breathtaking. Thanks for sharing. You did it again. Humor and Awesome coloring. Thank you for sharing your tips about the markers. Wonderful, love the new markers the colors are just great. Thanks for sharing. Really pretty card! I love the one layered card and all the masking magic as well! There is so much depth to the design. Beautiful colouring, as always. Will have to come back later to watch the video. You make any coloring look easy. Awesome job. Amazing card - such lovely flowers. Such a pretty card and flwoers! Very pretty cards. Love the bright background and how well it goes with the new marker colors. So pretty! Love your beautiful coloring! So beautiful Kelly - you hit it out of the park again! Wow! Love how you've made this gorgeous arrangement! Beautifully colored as always! Fantastic coloring! Those flowers look amazing!!! Maybe you could put a picture of a gnome looking out a window on the dishwasher so your son can "see" what is in there :) Gorgeous colouring as ever. Great card, stunning colors and a great tutorial and comment on how the Markers work. I always love your voice over by the video's, especially when you are telling everyday and so recognizable story's. Thank you so much. Beautiful card and your coloring is always inspiring! Thank you for sharing and for all the great videos you post! Oh no. This is an absolutely stunning gorgeous card.. your colouring are amazing and your design too. Your colouring is seamless and its always jaw dropping to see what you create. GORGEOUS coloring. Love the colors of these 2 releases and your card brought a bit of spring on a chilly morning! WOW! WOW! WOW! This card and your coloring are incredible! Oh my !! Your card is simply amazing ! I love the effects you get when masking. A lot of work, but the results are beautiful. The new markers are being shown off so well by some amazing talented artists. Thank you. I am so inspired by your talent!! The card you created is beautiful and I love how the colors look. Love the design. Beautifully colored. Wonderful coloring, I'd love to try these new markers! I especially love the vibrant colors of both flower and background! Love , love, love your videos , the voice overs are both educating and fun. Keep 'em comin Kells love ya' much. What a beautiful card! The colors are striking! Definite inspiration for a newbie! As always Kelly your card is AMAZING and as always....you have inspired me! TFS! Beautiful card Kelly. Love the realistic look of the flowers and shine on the cup and saucer! Thanks for sharing, I'm coming back to watch the video later. The colours are so vivid and bring the flowers to life. Thanks for sharing the technique video. The Altenew stamps are so gorgeous, and your coloring makes it look like I could reach out and pick those beautiful flowers! I learn so much from watching your videos, and love the stories you tell while you create! I think I've fallen off my chair laughing more than once! Thank you so much for sharing with us!!! Wow!! YOU are amazing!! Beautiful cards. Brilliant card! I love that image and the flowers just pop right out with those colours. Thanks for prize from the last hop! Can't wait to buy something! Hello! :) Just dropping by to know if the winner for your giveaway was announced..